The excitement of the introduction of self-service checkouts at the turn of the millennium was fuelled by potential cost savings on labour for retailers, speedier queuing times for customers, and potential to increase customer loyalty in retail. Ten years on, the efficiency of do-it-yourself checkouts has been criticised, particularly when it comes to managing queues. Trade magazine, The Grocer, compiled figures indicating average queuing times for the two retailers with the most self-service checkouts (Tesco and Sainsbury's) have increased over the past two years. However, the two firms, like other retailers, have claimed that queuing times have actually fallen due to the introduction of self-service tills. 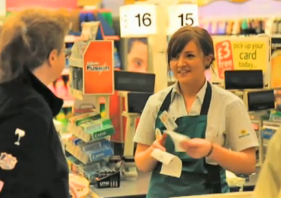 So what has been the impact of self-service compared to staffed checkouts on queuing times? The media have got involved in the debate too, testing from the customer's point of view which queue method is really shorter. Journalists from The Sunday Telegraph visited Tesco, Sainsbury's and Marks & Spencer, each time purchasing two identical baskets of groceries via staffed till and self-service. In five out of nine of the visits self-service was slower. The Daily Mail carried out a similar experiment in four major British supermarkets and found in 3 of 4 of them, that they passed through manned checkouts faster. In one astonishing instance, the self-service took 20 minutes against a modest four minutes at the staffed checkout. What other factors impact on the queue methods? But self-service checkouts don't just affect queuing time it seems. Research by Stoplift found that theft is up to five times higher with self checkout compared to staffed checkouts. Classic intentional tactics to steal with self-service include weighing in expensive items (such as steak) under the category of cheaper produce such as bananas, leaving items in the shopping cart or in recyclable bags on the floor, or overloading the scales rendering them insensitive. Nevertheless, manned checkouts are not without their problems. For example, “Sweethearting”, where a member of staff intentionally gives away products to a customer by not scanning them, is estimated to cause a 25-30% inventory shrink. There are also technical glitches of self-service to contend with, such as erroneous "unexpected item in bagging area", scanning difficulties and rejection of currency, which make customers angry and frustrated. In fact, a survey by Usdaw revealed frustration at self-service tills could cause shop worker abuse. In short, if your store is debating whether or not to purchase self-service tills, then these points need to be considered. Think about who your customers are: Do you operate in a relatively tech-savvy region; do your customers prefer to be served by a real person, or both? Remeber as well that queuing is the top customer pet hate when it comes to retail customer service. In short, accurate retail data for your store is the key to making the decision.